For the first time ever, KitchenAid brought one of the worlds most exclusive food festivals to cooks across the country by democratizing the FOOD & WINE Classic in Aspen. We partnered with celebrity chef Chris Cosentino to bring his menu from the festival to everyone. VIDEOS: We created a series of 3 videos for each course of his challenging menu from the festival. Instead of doing a step-by-step recipe tutorial, the videos focus on some of the more challenging aspects of the recipe and give Chef's tips for pulling the meal off. PRINT: We ran a single page ad the month of the festival letting consumers know about the program. The month after the festival, we ran this 4-page print ad showing off the menu and our appliances so that consumers know it's not too late to have one of the most exclusive meals in the world. SOCIAL: We live streamed Chris Cosentino's demo from the festival connecting the audience at home with the audience in Aspen. 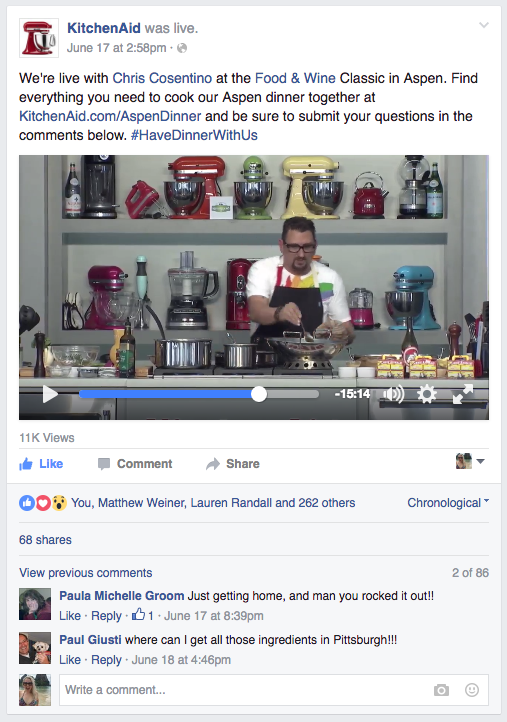 This was KitchenAid and our agencies first time doing a FB Live event. We also created a series of posts to promote the program, engage our fans and help them pull off this challenging menu. HOMEPAGE TAKEOVER: We had a few different high impact media units that supported the program and all of the incredible content we got in partnership with Food & Wine. We worked with their editorial team to create wine pairings, hosting tips and everything needed to create the festival at home. ADDITIONAL ELEMENTS: we created OLA, CRM emails and and blog posts from top influencers like Joy the Baker and on KitchenAid's blog.